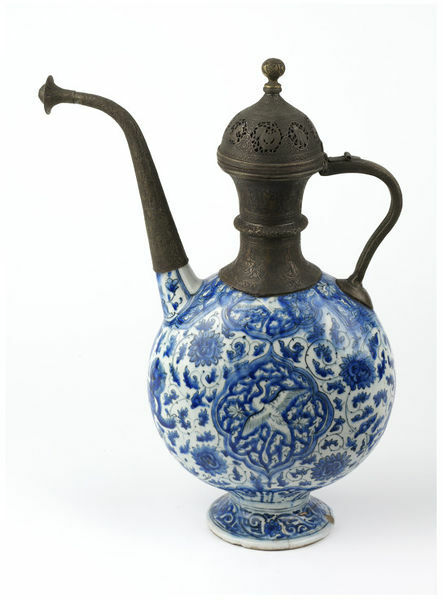 Sprinkler of fritware, with bulbous body, painted in underglaze blue with storks and animals in ogival panels amidst floral scrolls; mounted with engraved brass handle, spout, neck and lid of later date. 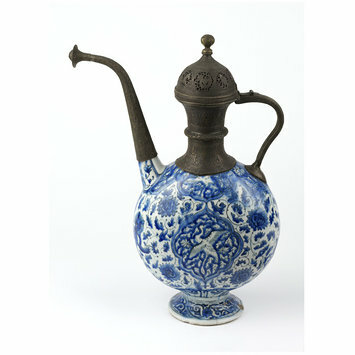 This object was purchased in Tehran in 1873, by Robert Murdoch Smith on behalf of the Museum. In his first bulk acquisition for the South Kensington Museum (today the V&A), Murdoch Smith had bought "a considerable collection" of over 100 examples of metalwork, ceramic, inlaid woodwork and textile from different local sources, including French diplomat Emile Charles Bernay and four art-dealers: Nasrullah Dellal, Abu'l-Hassan Dellal, Abdul-Husayn and Reza Kashi of Tehran. Many further acquisitions followed in the years 1873-1878 and 1883-1885, most extensively from the art-dealer Jules Richard, long resident in Tehran. 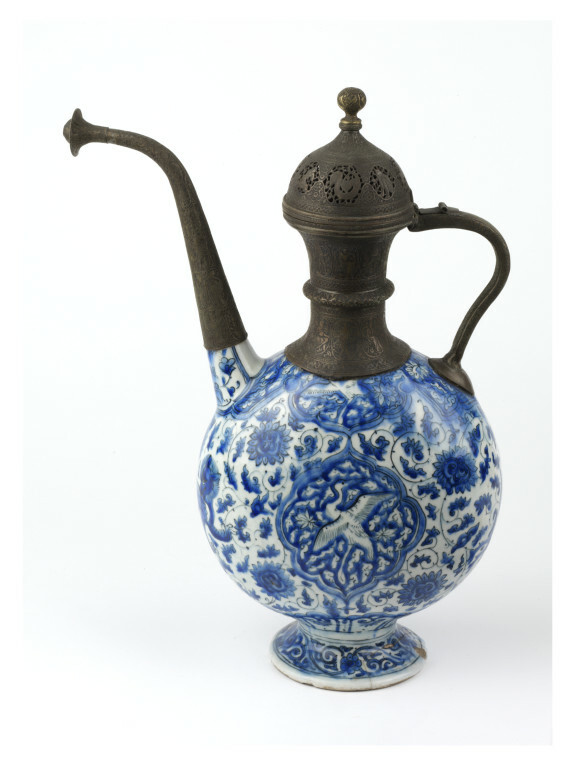 Crowe, Yolande, Persia and China: Safavid Blue and White Ceramics in the Victoria & Albert Museum (1501-1738) (London : Thames and Hudson, 2002): cat. no. 79, p.86.